As with most other questions surrounding the festivals of Christmas and Epiphany, the dissemination of the December festival in the East (and, as we shall see, the reverse process in the West) has been surrounded by controversy that will not soon, it seems, yield to perfect agreement. In Syria a festal list in Apostolic Constitutions V.13 gives first place to a feast of the Nativity (Genethlion) on the twenty-fifth day of the ninth month, that month number repre­senting the Syrian acceptance of April as the paschal first month. That festival of the Nativity is followed, on the sixth day of the next month, by the feast called Epiphania, on which, the text says, “the Lord made to you a manifestation of his own deity”. That descrip­tion would fit either the baptism or the miracle at Cana, and may have reference to both. Here, in any case, the December festival is known as the Nativity and that in January retains the title of Epi­phany. The presence of both festivals here is a critical item in the difficult question of the date of Apostolic Constitutions. Funk, largely on that basis, assigned the collection to the turn of the century, ca. 400. Others (Altaner, Quasten) have favored a date some twenty years earlier. Botte argued that at Antioch itself the festival of December 25 was introduced in the first year of Chrysostom’s preaching, 386. This argument is based upon a careful analysis of several of his sermons. The first of these is the first sermon on Pentecost. In the course of situating that festival within the general scheme of the year, Chrysostom enumerates three festivals, Theophany, Pascha, and Pentecost, and says specifically that the Theophany is the first, on which, “God has appeared on the earth and lived with men [Bar 3.381, and thereafter God the only begotten Son (pais) of God was with us, and is so still, for he said, ‘Behold I am with you all the days until the consummation of the age’ [Mt 28.20]” (PC 50.454). Two points urged by Botte with regard to that sermon are that it makes Theophany the first festival of the year and that it makes it the festival of the incarnation. In another sermon, on December 20, 386, a feast of St. Philogonios, Chrysostom announced the coming celebration of the Nativity of Christ and urged all the people to prepare themselves for this feast. It is of great importance, he urges, because all the other festi­vals, Theophany, Pascha, Ascension, and Pentecost, take their origin from it, since if Christ had not been born in the flesh, he could not have been baptized, and it is that baptism that is celebrated at Theophany (PC 48.752). A third sermon was preached by Chrysostom on the feast of the Nativity itself, December 25, 386. There he declared that he had long wished to see that day. He added that this date of Christ birth had been known for less than ten years. Does that mean that the festival had been celebrated at Antioch for some years already? That is the point at which scholarly opinion divides. Botte, and others following him, have urged that Chrysostom’s first Pentecost sermon was preached prior to the introduction of Christmas and so makes no reference to it, placing the Theophany as the first of the festivals of the year. For Botte, indeed, that Pentecost sermon asso­ciates the incarnation with Theophany so strongly that the distinc­tion made in the (subsequent?) sermon on the feast of St. Philogonios can only be understood as a change of orientation. However, a fourth sermon, preached on the Epiphany following December 25, 386, makes the point that Christ was not revealed to the majority at his Nativity; that revelation of his divine identity to all the people came only at his baptism. So understood, what is said of Christ in that first Pentecost sermon (viz., that at Theo­phany God appeared on the earth and lived among men) could still be said after the adoption of the December Nativity feast. As for the indication there that Theophany is the first of the festivals of the year, the question must be posed whether Chrysostom is naming all the festivals or only that older triad of Epiphany, Pascha, and Pentecost as analogous to the pilgrim festivals of the Old Testa­ment: Tabernacles, Passover, and Weeks. That analogy is fre­quently encountered in patristic literature and, indeed, Chrysostom himself relates the festivals of the New Testament to the Old in that very Pentecost sermon, citing Exodus 23.17 (PG 50.453). If a distinct festival of the Nativity is not included in that triad, neither is the Ascension, another festival on which Chrysos­tom preached and to which he refers in this same Pentecost ser­mon (PG 50.456). It remains uncertain, then, whether the first sermon on Pente­cost was preached prior to those on Blessed Philogonios and on the Nativity. With that uncertainty arises the further uncertainty re­garding Chrysostom’s statement that the date of the birth of Christ had been known for fewer than ten years. If the first sermon on Pentecost does not limit the introduction of the feast of December 25 to the year 386, then that expression might well mean that the festival had been celebrated. at Antioch for some years. More interesting, perhaps, than the disputed historical question of the year that the December festival was introduced at Antioch is Chrysostom’s conviction of the historicity of the Nativity date and his argument for that. In his sermon Eis tin genethlion, Chrystostom says, as mentioned, “it is not yet the tenth year since this day has become clearly known to us,” adding that like a noble sapling planted in the earth, “this, which has been known from of old to the inhabitants of the West and has now been brought to us, not many years ago, has developed so quickly and has manifestly proved so fruitful” (PG 49.351). That provides the point of the first of Chrysostom’s three demonstrations of the historicity of the Na­tivity date, viz., the very speed with which the feast has blossomed (anthesai ten eorten), appealing to the argument of Gamaliel in Acts 5.38f. to show that it is of God and not of men. His second demon­stration is based on the census mentioned in Luke 2, and the assur­ance he has received from those in Rome that records of such a census exist. His third demonstration (of which notice was taken in Section 5 above) replicates the argument of the tractate De soltitiis, making Zechariah the high priest in the Holy of Holies on the Day of Atonement when he received the announcement that Elizabeth would conceive. After six months came the annunciation to Mary, and nine months from that, this day of the Nativity, although, as noted above, his setting of the annunciation in April reveals a ves­tige of the older oriental paschal conception date. Chrysostom’s presentation of these computations, devoid of reference to the quarter-tense days, is further interesting in that the reasoning em­ployed in De soltitiis was not treated merely as fanciful solar sym­bolism, but as historical computation. To whatever year we assign the introduction of Christmas at An­tioch, the feast was observed at Constantinople from around the beginning of the reign of Theodosius I. In the imperial city, the accession of Theodosius in 379 marked the end of that church’s Arianism and brought a new theological and political climate. One symptom of the resurgence of orthodoxy was the invitation issued to Gregory Nazianzen to come to Constantinople, where he was made archbishop in 381 and reigned for a brief period. From his time there, we have sermons on the Nativity (which he calls “Theophany”) and on the feast of Christ’s baptism (which he calls “The Feast of Lights”) preached, respectively, on December 25, 380, and on January 6, 381. In the latter of those sermons, Gregory refers back to the festival of December25, and says, “At his Nativity we duly kept festival, both I, the exarchos of the feast, and you and all that is in the world and above the world” (PG 36.340). Dam Bolle takes that term, exarchos, to mean that Gregory was the founder of that festival in Constantinople and personally responsible for its in­stitution there. A number of commentators, however, have made the point that this is not necessarily the meaning of the term at all. It need mean nothing more than that he presided over the liturgi­cal celebration. We cannot, on the basis of the occurrence of that term alone, date the appearance of the December festival in Con­stantinople. What can be said with reasonable assurance is that it seems highly unlikely that the festival would have been adopted from Rome under an Arian emperor. Therefore, if not adopted since the death of Valens, it would have had to be a very early feature of the Byzantine liturgy, given the brevity of the episodes of orthodoxy in the imperial city between Constantine and Theodosius. If the insti­tution of Christmas at Rome had as much to do with Constantine’s solar piety as has been urged by some, one would expect him to have pressed for the festival in his new capital, but of that we have no evidence whatsoever. If, on the contrary, we are to look for the introduction of the festival of December 25 after the fall of Valens, then the interpretation of exarchos becomes somewhat academic. If Gregory Nazianzen did not preside at the first celebration of Christmas in Constantinople in 380, that occasion was no more than the second such celebration of the feast. In Cappadocia the situation is similar to that in Constantinople, the Nativity festival on December 25 is called “Theophany” (but sometimes "Genethlia”) and the festival of January 6 celebrates Christ’s baptism and is called “The Feast of Lights.” This was the ease with Gregory of Nyssa and Basil, as well as others in Cappa­docia. Amphilochius of Iconium, in a Christmas sermon (PG 39.3644), uses only ta genethlia to designate the festival. The Byzan­tine tradition finally settled on that title for the December feast, us­ing both Theophania and Ta phota of that in January in the typika of Hagia Sophia in the ninth and tenth centuries. From the time of the restoration of orthodoxy with the accession of Theodosius, then, the observance of the Nativity festival on De­cember 25 extended smoothly and swiftly from Constantinople, across Cappadocia to Antioch. The older festival of January 6 con­tinued to be observed with the theme of the baptism of Jesus. If be­tween Constantinople and Antioch there continued some confusion as to which of these was the Theophany of Christ, we can suppose that this was an ambiguity already in the earlier unitive celebration of the birth and baptism on that day. The reference of the incarnation to a precise point in the life of Jesus is ambiguous, indeed, in the prologue of the fourth gospel. It was otherwise, however, in Jerusalem and Alexandria. At Jerusalem the old festival of January 6 celebrated the Nativity alone, without reference to the baptism. This was also true for Epiphan­ius, a native of Palestine (although he set the Cana miracle on the same day). As did Chrysostom, Jerome argued in his commentary on Ezekiel that at his Nativity, Christ was not manifested, but hid­den, contrary to this Palestinian tradition (PL 25.18C-19A). Still, that tradition continued firm at Jerusalem throughout the fourth century and beyond. There are signs that the December festival was adopted at Jerusalem at some point in the fifth century, and the episcopate of Ju­venal (424-458) is indicated. We have two sermons for the feast by Hesychius, preacher in the Holy City from 412 to his death in 451 (PG 93.1449). Nonetheless, that institution of the feast proved to be only temporary, since around the middle of the following century Cosmas Indicopleustes (PG 88.197) comments that the church of Jerusalem is unique in celebrating the birth of the Savior on the Epiphany, commemorating David and St. James on December 25. That was also the situation earlier, in the lectionaries from between 417 and 439 preserved in Armenian, where December 25 is the feast of David and James. However, a principal manuscript of that Jerusalem ordo (Jerusalem, arm. 121) adds to the title of that feast the rubrical note, “in other cities the birth of Christ is celebrated.” The editor shows conclusively that this note belonged to the Jeru­salem ordo itself prior to the introduction of the festival by Ju­venal. Just when the December Nativity feast was introduced in Jerusa­lem and just when it was given up cannot be more closely speci­fied. That it was no longer observed in the sixth century is testified to not only by Cosmas Indicopleustes but also Abraham of Ephe­sus (530-553) who, in a sermon on the Annunciation, indicated (as did Cosmas) that the Palestinians were alone in rejecting the feast of the birth of the Savior on December 25. The celebration of the feast throughout the empire was ordered by the emperor Justin II (565-578), according to the historian Nicephorus Callistus (PG 147.292), and a letter of Justinian a few years earlier (561) had called upon Jerusalem authorities specifically to keep the Annun­ciation (previously not observed at Jerusalem) on March 25 and Hypapante on February 2, forty days after December 25, rather than February 14. That letter also makes it clear that by then the Epiphany at Jerusalem celebrated both Christ’s Nativity and bap­tism, an arrangement jealously defended by Monophysite forces against the separate celebration of the bodily Nativity on December 25. Nonetheless, shortly after the death of the patriarch Macarius II (567/568), Jerusalem finally adopted the December festival, and the itinerary of Antoninus of Plaisance in 570 reports the observance of the Epiphany not at Bethlehem but at the place of Jesus’ baptism on the Jordan. In Egypt, also, the feast of December 25 was resisted for some long while. From the end of the fourth century we have the tes­timony of John Cassian that the content of the Epiphany in Egypt was both the Nativity and the baptism, celebrated together. His testimony is the first secure notice we have of a liturgical observance of the Nativity of Christ in Egypt. Cassian, writing at Mar­seilles between 418 and 427, says in the tenth of his Conferences (chap. 2) that the themes of birth and baptism are united in the one festival. “In the country of Egypt this custom is by ancient tradition ob­served that-when Epiphany is past, which the priests of that province regard as the time, both of Our Lord’s baptism and also of his birth in the flesh, and so celebrate the commemoration of either mystery not separately as in the Western provinces but on the single festival of this day-letters are sent from the Bishop of Alexan­dria through all the churches of Egypt, by which the beginning of Lent, and the day of Easter are pointed out not only in all the cities but also in all the monasteries” (NPNF II.XI, p. 401). Since the writer’s purpose here is to describe the issuance of the festal letters by the bishop of Alexandria, it is unlikely that he is describing a variation in the festal theme in different parts of Egypt, although it is certain that there were variant customs within that country. Cassian, nonetheless, evidently indicates a double theme in Alexandria itself. It is impossible to know how long that double theme had attached to the festival. We can only say that the identification of the date as that of the Nativity reaches back as far as Clement, as does its association with the baptism, but that ear­lier in the fourth century the feast was focused on the baptism to such an extent that the Canons of Athanasius make no reference at all to any festival of the Nativity. It may well be that while the strong Marian tradition at Alexandria made the baptism (with which Mark’s gospel opens) stand out as the content of the celebra­tion on January 6, the memory persisted that the gospel was begun on that day because it was the day of the Lord’s Nativity. It was only in the fifth century, in any case, that the festival of December 25 was adopted at Alexandria. There, following the Council of Ephesus, Paul of Emessa preached before St. Cyril on December 25, 432, and again on the following January 1 (PG 77.1432). 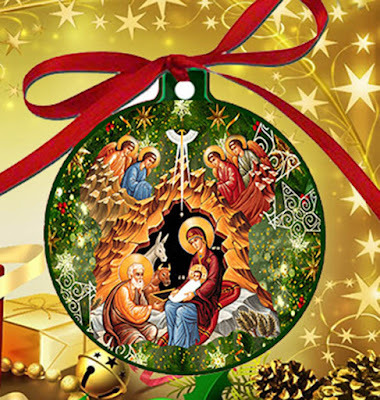 This marks the first celebration of the Nativity on Decem­ber 25 at Alexandria of which we have record. In view of its rela­tion to the Council of Ephesus, it seems likely that the December festival’s adoption in Alexandria was motivated by Christological concerns, as was the case earlier at Constantinople and through Asia Minor to Antioch following the death of the Arian emperor, Valens. The adoption of Christmas at Alexandria, again, may have contributed to the unsuccessful and temporary establishment of the feast a bit later in Jerusalem. Source: The Origins of the Liturgical Year, Minnesota: Liturgical Press Collegeville, 1991.